Description: Those types of dreams are pretty scary for everyone, not just for the dreamer. Description: I woke up with a serious headache. It felt like something hit my head. I rubbed my head to find a bump on the back of my head. It was a pretty big bump, too. The bump hurt whenever I touched it, so I decided not to rub it. 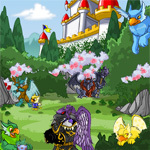 Description: I looked around us, then at the three Neopets. I still couldn't figure out who they were or where we were. No matter how hard I tried, I didn't remember anything presented to me. Description: I told Jane about my dream as we were walking back to that building in the forest. I described it more vivid than I could describe what happened two hours ago. I didn't know why I remembered that dream, but I did know that it was more than a dream. 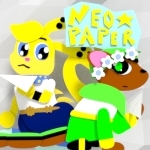 Description: I was walking through Neopia Plaza with the Korbat. It has officially been a whole day since all of this started. Maybe I would remember something today. Description: The Korbat and I walked through the winding hallways of the building - base, was what the Korbat said. I navigated it like I had for all of my life. It was almost routine for me. Description: I should've seen it. Even with my amnesia, I should've seen that Dee was Jackie. She was pretending to have amnesia. She responded to the name Jackie. She had a better grip of what was going on than I did. I should've known something was up with her. It was too obvious. Description: This is how you get a monster hunter mad. Description: He stayed around much longer than he planned to. If I recalled correctly, he asked for an extension at least two times (I was honestly surprised by this fact when James first told me). He said that he really liked working with us. None of us really minded – we liked working with James, too. Description: I knew it was a big campus, but this was much bigger than I predicted. Surely with a campus this big, there were a lot of students that had many different stories. Not to mention the amount of area we had to cover in search of clues. Description: This isn't my test!” James exclaimed. He slammed the paper down on the table. “I remember exactly I wrote for my essay and this isn't it!” “But that's your handwriting,” I informed as I looked at the paper. It was James' handwriting. I could recognize it easily.